At a party a while back (it was a cocktail party, I had to wear a dress, which I don’t necessarily enjoy so to distract my mind from the uncomfortableness, I focused in on the food tables looking for ideas! ), they had these little things I thought were hummus stuffed sushi. I took a bite, but to my surprise they were hummus stuffed cucumbers! What a delight! So…here’s my take on this cute little appetizer. I’ve adapted this recipe from one in my not always so healthy for you Better Homes & Gardens cookbook for Asian inspired deviled eggs. These make great snacks or appetizers for your own party! 1.) Start by cleaning and slicing the cucumbers into 1 1/2 inch thick coins. Hallow out the centers using a melon baller or small spoon, leaving a little at the bottom of the cucumber so the filling doesn’t leak thru. 2.) Throw all the remaining ingredients into the food processor or blender and puree (including the scooped out cucumber seeds!). When it’s mostly smooth, spoon (or use a piping bag) filling into the cucumber cups. Refrigerate two hours before serving. If you have leftovers, try it spooned over a salad or as a spread for a sandwich or wrap! Experiment with flavors!! … curry? mint? roasted garlic? You can also stuff with various salads (egg salad, salmon salad, chicken salad, black eyed pea salad…etc). 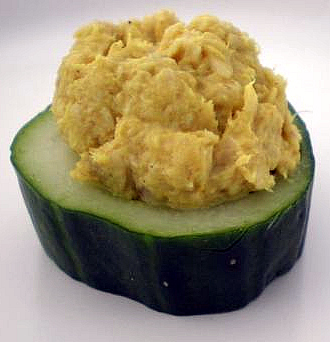 Another idea is using raw zucchini cups instead of cucumber. So many possibilities!